What is the difference between drama and contrivance? What separates melodrama from the catharsis that occurs in a deeply moving work of film or theater? 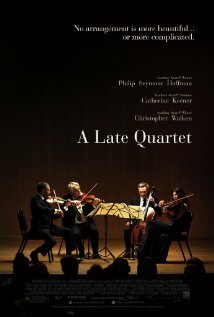 Yaron Silberman’s A Late Quartet starts off with Christopher Walken quoting T.S. Eliot’s Four Quartets and explaining to his students how they are related to late Beethoven. Beethoven’s String Quartet No. 14 in C minor, Opus 131 as rendered by the Brentano String Quartet, which plays the musical equivalent of the stunt man in the film, adds to the leitmotif of late works of music being rendered by aging musicians. After this the two central plot devices are Parkinson’s disease and flamenco dancing. The Parkinson’s Disease interrupts the career of the quartet’s cellist, Peter (Christopher Walken), and a stunning flamenco dancer (Linaz Charhi) interrupts the marriage between Robert (Phillip Seymour Hoffman), the second violinist, and Juliette (Catharine Keener), the violist—both of these in turn threatening the upcoming season of their group, the Fugue String Quartet. A burgeoning romance between Daniel (Mark Ivanir), the first violinist, and Alexandra (Imogen Poots) Robert and Juliette’s daughter is literally interrupted by her mother who has previously had an affair with Daniel. There is a subtheme of passion and intellect as manifested in the conflict between the studious Daniel and the more romantic Robert, but A Late Quartet is less concerned with violin than heartstrings. One might think that veteran actors would shine some light on the aging musicians they play, but the stellar cast chokes on the lines of a plodding and predictable script. It’s another version of the locomotive bearing down on the young girl tied to the tracks. Usually the dramatic music accompanies the action. In A Late Quartet, it’s the other way around.